Like many Arizona residents, the entire Sublime crew enjoys the beautiful area we live in and spend most of our free time outdoors with our dogs. As the temperature begins to rise, so does our concern about our dogs encountering rattlesnakes. It is rare for a dog to naturally fear snakes. Too often, a dog's curiosity leads to a bite from a rattlesnake that is very painful, can cause permanent tissue damage, ALWAYS requires immediate veterinary care and in the worst cases, can be fatal. 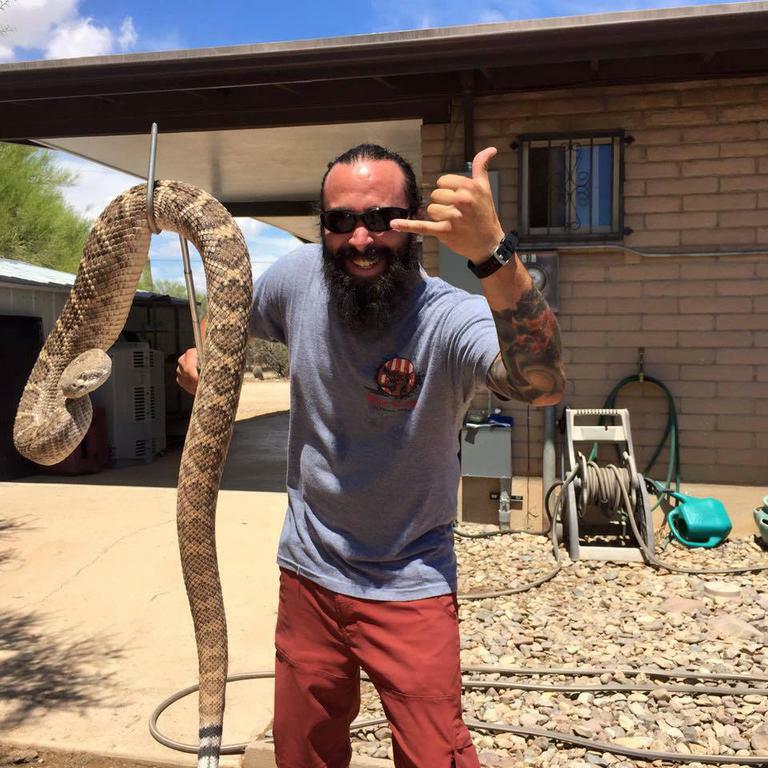 In the Tucson area alone, several hundred dogs are bitten by rattlesnakes every year—Arizona is home to more species of rattlesnakes than any other state.. It is estimated that 85% of those bites happen in the dog’s own yard. Each case is traumatic and expensive for all concerned. At Sublime Canine, we offer the most comprehensive Rattlesnake Avoidance Training for dogs. Our goal in this training is to educate dogs about rattlesnakes. Along with familiarizing dogs with what snakes look, sound and smell like, we must especially teach them to stay away if they encounter one. We have been successfully training dogs to avoid rattlesnakes since 2004, and our services are utilized by police, search and rescue groups, working dog clubs and pet owners. We offer Private Lessons and Group Classes for Rattlesnake Avoidance. Rattlesnake Avoidance Training - This is the most common form of snake avoidance training. The dog wears an electric collar and we allow it to find and approach a live, devenomized, rattlesnake. When the dog shows interest in the snake, it gets a stimulus from the electric collar. The dog associates the stimulation with the rattlesnake and no longer wants to interact with the snake. This is called escape/avoidance training, and is similar to the experience of touching a hot stove—you only need to touch the stove once to know that it is hot and not touch it again. This is the training in summary, but there are many more intricacies involved in the actual training process. "All Positive" No-Shock Rattlesnake Avoidance Training - We added this service in 2015 in response to requests from clients that were uncomfortable with using electric collars on their dog and wanted another option. As with escape/avoidance training, we teach dogs what a rattlesnake looks like, sounds like and smells like, but then teach them a safe response behavior much like a medical alert dog or a drug detection dog would do when performing its duties. This is not “avoidance training” per se, but does teach dogs a safe behavior to perform when they encounter a rattlesnake without the use of an electric collar. Because this training requires multiple sessions, there is a significant price difference between it and the other Rattlesnake Avoidance service that we offer. JJ’s Blurb: It is only fair that we explain our views on the two types of training. It is well established that escape/avoidance training is faster and produces a more certain and long lasting impression on dogs. The "all positive" method does not require the use of a shock collar, but depends on the dog’s desire to offer the behavior outweighing its curiosity. While the escape/avoidance method has its drawbacks, especially its crucial dependence on the judgment of the trainer, we feel that for most dogs it is preferable given our level of experience and the degree of risk involved with rattlesnakes. We respect the life of every animal we work with at Sublime Canine, including our rattlesnakes. We use live Western Diamondback Rattlesnakes (the most common species in our area) who have had their venom glands surgically removed by a licensed veterinarian. We believe it is irresponsible to expose our client dogs to venomous animals, and that “defanging” or pulling the teeth from a snake (often without anesthesia) inhumane. Our rattlesnakes have gone through their own training to ensure they are suitable for our avoidance training program, and they receive regular veterinary exams. Brian - Brian is Sublime’s oldest and most experienced rattlesnake. He has been in our care since 2004 and is estimated (by veterinarians) to be 15 years old. Did you know that rattlesnakes can live 20+ years? He has helped educate thousands of dogs to avoid rattlesnakes and remains our #1 snake for training. Kevin - Kevin was named after Dr. Kevin Wright, the veterinarian that preformed his venomoid surgery. He has been with Sublime since 2009 and is estimated to be 9 years old. Kevin is typically the one teaching dogs about sound because he loves to rattle. June Bug (RIP) - June Bug was collected in 2004 and spent 13 years with Sublime teaching thousands of dogs to avoid snakes. She was the only female rattlesnake in our program. Did you know rattlesnakes don’t lay eggs and that they give birth to live young? June Bug was a favorite among many of our clients. We lost her to cancer in 2016. We were overwhelmed after her passing with letters and emails from people whose lives she touched. 1. Will the electric collar used in rattlesnake avoidance training hurt my dog? The state is more of surprise than pain. We’ve all been shocked before; it makes you jump and cuss, but it’s over in an instant. If done correctly, the dog believes the stimulation came from encounter with the snake and learning takes place. The real problem that can come from snake avoidance training is what is called "superstitious behavior." An unskilled trainer can easily make subtle mistakes that frequently result in dogs being afraid of the trainer, the owner, the location, the car, etc., rather than causing the dog to become wary of the rattlesnake. This means the dog was actually trained to avoid something other than snakes. The "trainer's" actions caused the dog to associate the stimulation from the collar with something other than the snake. 2. How long will the dog remember the training? Every dog is different. Some will retain the memory for life, while others need refreshers. Dogs that show a lot of interest during the initial training or dogs known to have high prey drives are good candidates for annual refreshing. Prey drive can override a dog’s sense of danger. Also, if a dog has a lot of exposure to snakes (has an owner that is an avid hiker, is involved in search & rescue training, bird hunting, etc. ), it is possible that the avoidance training can fade over time. These dogs have an unpleasant encounter with one snake during training, but can then encounter many snakes without any negative consequences. Over time, the lesson learned in the one snake avoidance session is watered down by the dog's other experiences with snakes. We recommend yearly training in these cases. 3. Will my dog alert me to rattlesnakes? Maybe. We hear many stories from our clients describing how they were alerted to the presence of rattlesnakes by their dogs' reactions. We don't teach dogs to be rattlesnake detectors, but when they come across one, their response and desire to avoid it is sometimes quite obvious. This can be welcome information for the handler. 4. Will my dog stay away from all snakes or just rattlesnakes? It varies from case to case. With our training, all dogs should avoid rattlesnakes and some may avoid all snakes. Dogs have difficulty generalizing, and if taught to avoid one kind of snake they may or may not avoid some or all other snakes. We go to the trouble of using live rattlesnakes to be sure they learn to avoid other live rattlesnakes. Similarly, we train dogs with loose rattlesnakes rather than caged ones to eliminate the possibility that they learn to avoid only rattlesnakes in cages, or just cages. Some trainers try to teach snake avoidance using fake snakes. The chances of success using a fake snake are slim, especially considering a dog's great reliance on its senses of smell and hearing, along with a superior ability to read movement. Another potential pitfall is that dogs can be location-specific learners and may easily learn to avoid snakes in one location but not others. 5. I use an electric collar for obedience. Will this affect the snake avoidance training? It is much easier to train dogs that have no familiarity with an electric collar to avoid snakes, because then the chances of them associating the stimulation with anything other than the snake is very slim (when done correctly). Typically, dogs that have been trained with an electric collar for obedience have an understanding of why the stimulation is happening and how to make it go away, so occasionally those dogs will default into obedience. This doesn't make the training less effective, but is something I make the owners aware of so that they understand what's happening and how to read their dog in a real-life situation. 6. Can I say “leave it” when you do the training so my dog knows to stay away? Absolutely NO. As described in the answer to 4 above, we take great pains to keep the dog from associating anything with the snake avoidance training except the sight, sound and smell of a rattlesnake. If you are talking to the dog or influencing it in any way, you risk teaching the dog something wrong. It’s important that we keep as much human influence out of it as possible. 7. My dog has been bitten by a rattlesnake so he knows to stay away from them now, right? We meet a lot of dogs that have been bitten twice. The first time, the owner thinks the dog learned a lesson. After the second time, they call us for training. Dogs have difficulty generalizing, and the real pain from a rattlesnake bite is not immediate enough for a dog to make the connection between bite and unpleasant experience. 8. Is there a guarantee that my dog will never get bit by a rattlesnake after training? Unfortunately, there are just too many variables (wind direction, camouflage, exhaustion, etc.) to guarantee that a dog will never be bitten by a rattlesnake after rattlesnake avoidance training. A dog might be fresh and alert the first ten steps of a hike, but the last ten steps of the hike it may be exhausted and focused more on getting to its car than its surroundings.